I have to confess something... For the past three weeks, I've been using woodcased pencils almost exclusively! My fountain pens just sat where they were. And that has everything to do with the arrival of these beauties: The Palomino Blackwings! I'd like to thank the people over at Firehose Amsterdam, a shop dedicated to luxury design items. They sent me a couple of different Palomino Blackwing pencils to try out! I will be reviewing all three standard issue Blackwing pencils individually. First up in this mini series, is this Blackwing 602. it's marketed as having the 'hardest' lead of the three, and it's supposed to be a direct copy of the Iconic Eberhard-Faber Blackwing 602. Eberhard-Faber Blackwings were produced during the past century, but the production ended about 20 years ago. Nowadays, the remaining original Eberhard-Faber Blackwings often sell for more than 50 bucks a piece, which is well over the price I'm willing to pay for a woodcased pencil (at least for now...). So a direct comparison between this and the original product is something I unfortunately cannot provide. 'Half the pressure, twice the speed', quite a catchy slogan! All three different Blackwing styles that are currently available (not including the limited edition 'Volumes' edition) each feature a different finish. 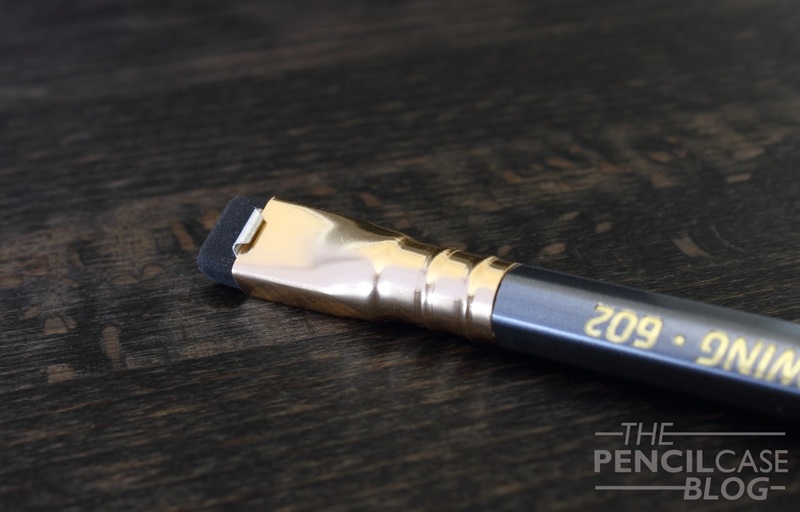 The 602 looks almost identical to the original, with a pearlescent blue-ish silver paintjob and gold lettering. 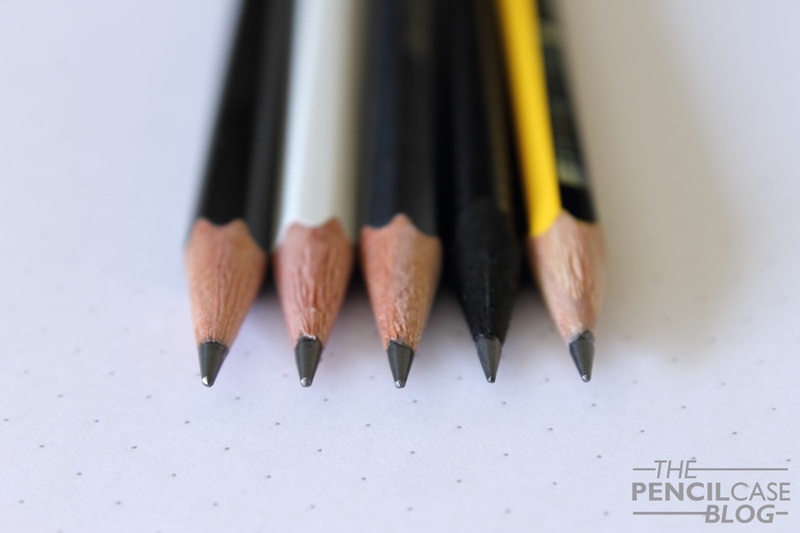 The brass-coloured eraser ferrule is the same on all three styles, but in this case it fits the overall design of the pencil quite well. Since the original model had a pink eraser, I'm ever so slightly dissapoined that they didn't go for the same looks with this one. Especially because pink replacement erasers are actually available from Palomino. 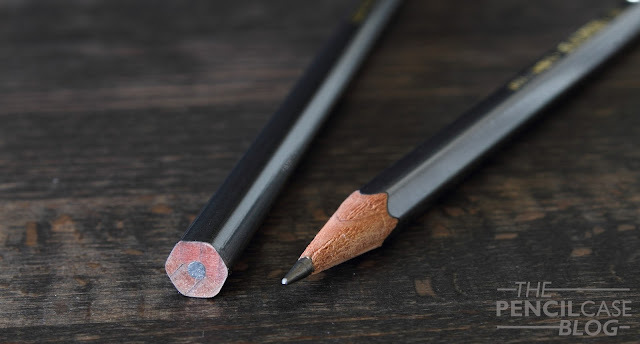 Recognising a blackwing pencil isn't that hard, just look for the funky-looking flat eraser and ferrule and you've found it! The flat eraser is both a unique design aspect and a functional feature. Whereas I'm usually not a big fan of erasers on top of a pencil, this one often finds some good use. I like the way the shape of the eraser breaks the straight, bland lines of a regular pencil. It's 'out of the box', and I love it! 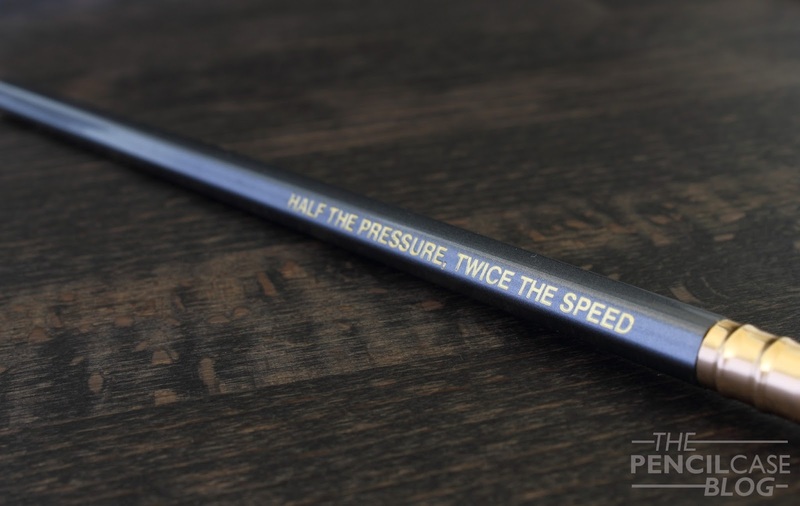 Overall, I think they did a very good job on designing these pencils. The attention for detail seems to be much higher than with most other pencils. It also seems as if Palomino succeeded quite well at mimicking the old version. On to the performance... Of course the blackwing didn't just get famous for its good looks and cool eraser. It's the lead that really made this pencil stand out from the typical #2 (HB). 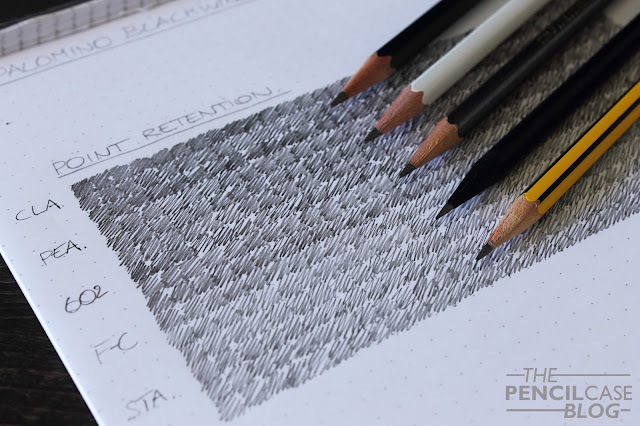 The super-smooth, soft graphite core has been a favourite amongst everyone, from writers, musicians, to cartoonists. The Palomino reincarnation succeeds at providing a similarly awesome lead as they did fifty years ago. As I said, I can't directly compare old versus new, but the moment you've used one of these, you just know Palomino did a fantastic job creating their own Blackwings! 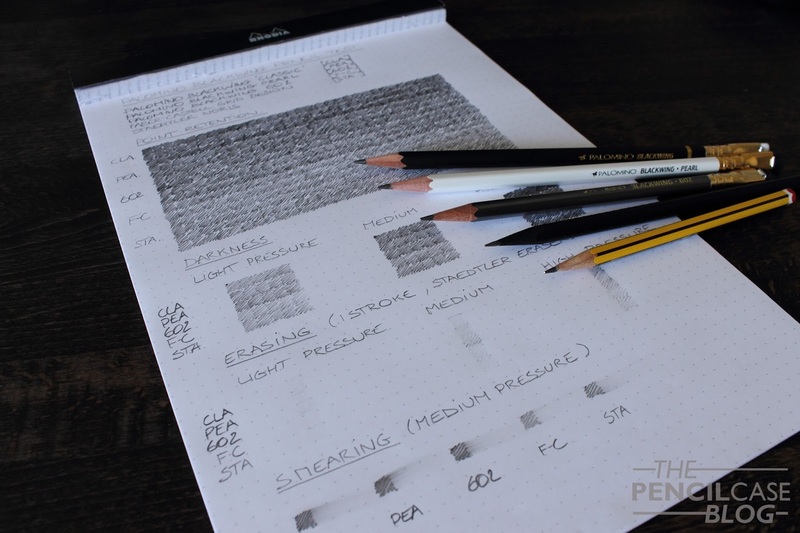 I often find it quite annoying/ difficult to describe how a pencil performs, so I did a few tests that should -hopefully- give you some idea of what it's all about. I included a scan of the full test sheet underneath the written review, so be sure to scroll all the way down! First off, I compared point retention. As you can see, I just coloured in a bunch of squares while trying to keep the pressure as even as possible. The results were kind of the way I expected them: as the 602 has the hardest lead of the three blackwings available, it also has the best point retention. The difference between the classic and 602 is pretty noticeable, but the pearl actually performed almost similarly. The two other test pencils (Faber-Castell Design -same as the well-known 2001 pencils-, and staedtler Noris), both HB, performed noticeably better than the blackwings, especially the faber-castell did an excellent job. The on-board flat eraser, while not yet as good as a full-sized eraser like a staedtler Mars, actually does quite a decent job at erasing pencil marks. The flat shape helps to get rid of larger areas, and it seems to do a slightly better job than most other pencils' erasers. The 602 is a great pencil. It's somewhere in between the very soft blackwing classic and a regular HB pencil, with the best properties of both. 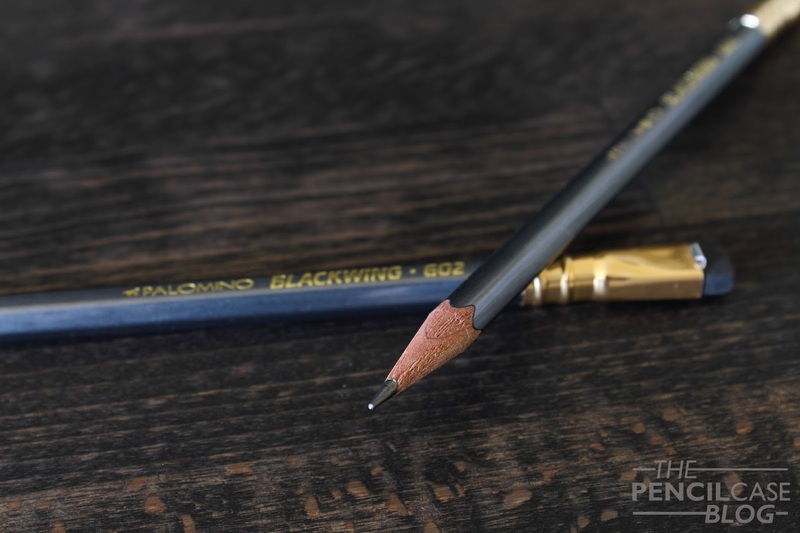 If you want an allround pencil with good point retention (something I find rather important), that is still a lot darker and smoother than a 'traditional' pencil, then the Palomino Blackwing 602 is the right choice for you. Note: these pencils were sent to me by Firehose, so I could write this review. I was in no way influenced in the making of this review, the opinions shared in this review are completely my own!